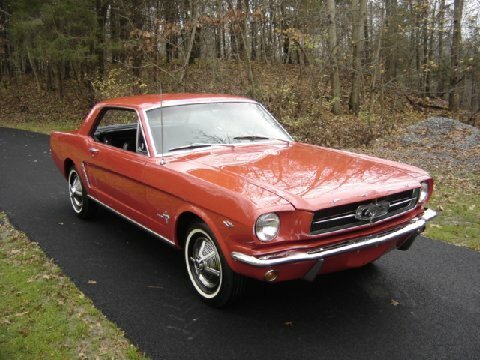 1964 1/2 Mustang Coupe "SOLD"
1973 Ford Mustang "Only 72,000 Original Miles"
1956 Chevy Belair 4 Dr Hardtop "SOLD"
1966 Dodge Coronet 440 "True Survivor"
1969 Chevelle "Full Frame-up Body Restoration"
1966 Nova Super Sport "SOLD"
1969 Ford Tornio GT Sports Roof "SOLD"
1966 Ford Fairlane 500 National Event Winner "SOLD"
1975 Firebird Formula 350 Numbers Matching Ram-Air 4-Speed "SOLD"
1969 Dodge Super Bee Documented CA Car "SOLD"
1930 Ford Model A Coupe "STREET ROD"
1964 Mercury Marauder 390 Tri-power / 4-speed "SOLD"
1967 Pontiac Firebird 400 CA Car "SOLD"
1966 Chevy Biscayne Big Block / 4-Speed "SOLD"
1967 Chevy Chevelle Malibu "SOLD"
1970 1/2 Camaro RS / Z28 "SOLD"
If you're a fan of early model Mustangs,then take a minute & check this baby out.Fresh out of private collection is this very original low mileage 1964 1/2 Mustang Coupe. Dual exhaust,Rally-pac,Tissue holder & more! Laser straight.Excellent Ragoon Red paint.Fantastic undercarriage. Needs nothing.Ready to drive & enjoy!